A freak injury derailed what otherwise would have been an exciting main event. 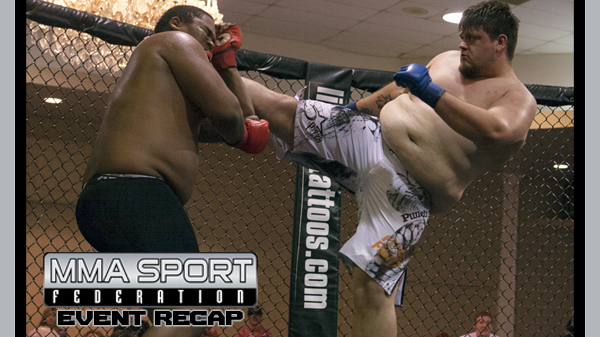 In the finale of Friday's MMASF fight card Scott Futrell and Clay Mitchell came out swinging. While Futrell was landing the majority of the quality shots, Mitchell was not backing down and hung in there with the taller opponent. As the round came to a close it was obvious something wasn't quite right with Mitchell. He took to one knee between rounds and never answered the bell to start round two. An old shoulder injury resurfaced and the middleweight from Carlyle could not continue. Before the event a 10-bell salute was held to honor the untimely passing of Jason Bosler. Bosler had many ties to the area and even made his pro debut in the very same building in May of 2011. Jon Rosener from Watson Martial Arts looked impressive in his quick win over Richard Jones. Rosener landed several punches before Jones went for a take down. Rosener capitalized by sprawling away from his opponent and locking on a guillotine. After Rosener pulled guard, the fight was over. In a bantamweight feature fight, Erion Zekthi showed why many people are excited about this young prospect. Now 4-0, and fighting for CMMA, Zekthi started the fight with a teep kick that can only be described as "explosive". Zekthi was able to stay outside of the range of his opponent, and land hard punches of his own. Shortly before the bell rang in the first, Zekthi landed a beautiful combination, KO'ing his opponent. Hofman suffered a broken jaw. Zekthi will return in August to compete and promoter Jenkins has hinted that big things are on the horizon for him. Korey Smith was victorious in a spirited super heavyweight battle. Both fighters wanted to win, and it showed as they let it fly all three rounds. A late rally by Cannon almost swayed the judges to his favor, but ultimately Smith had done enough early to win the fight by a narrow split decision. Cynthia Kues and Royal Schirmer battled late into the third round before a very popular Schirmer was able to score a TKO much to the delight of her fans. Most of this fight was fought on a clench which made for a slower paced fight. Schirmer had much better stand-up and finished the fight once the opportunity was given. Trevon Crawford scored a quick submission over Jon Bowers. Nick Kreutz looked impressive and controlled all of the action in his three round fight with Bo Brooks. Kreutz fought for a rear naked choke for a good portion of the first round and a brief stint in the second, before getting a TKO victory midway through the third. Kevin Roper scored a vicious KO over Nathan Downs with some very heavy leather. Wendy Julian and Jen Reed battled in a very technical women's Muay Thai special feature. Julian won by split decision although realistically controlled almost every round of the fight. Julian came to the cage very shy, but once the bell rang, came out firing. Johnny Cox defeated Trevor Lanzone by split decision. A small intermission was taken between the end of the fight and the announcement of the winner due to Lanzone getting sick in the middle of the cage. Lanzone had given all he had in the fight, and apparently some after. Jamese Taylor overwhelmed his opponent winning by TKO early in the first. Dylan Shroeder and DJ Jones started the night off with fireworks. Up until the Super Heavyweight battle this was the fight of the night. Shreoeder and Jones battled back and forth until Schroeder from MCS was able to land an armbar late in round three. MMASF returns August 23rd at Shady Jacks in downtown St. Louis.